Disclosure: My cousin received the following for review. All opinions are her own. 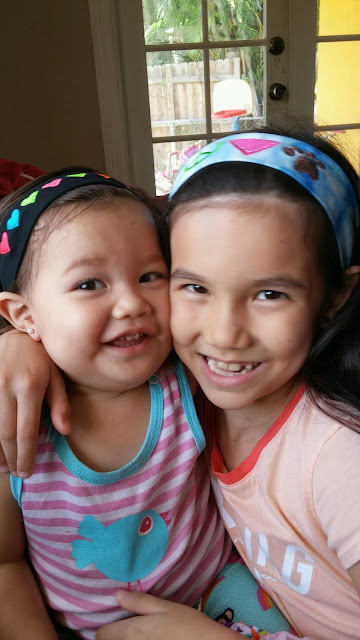 My girls received customized headbands from Logo Loops, and we couldn't be happier! It took me forever to choose which headbands to get when I was ordering, but I decided to start off with four different headbands for now, although the possibilities are endless. Logo Loops has designs for every occasion. They have everything from sorority logos to spiritual/ faith based designs at http://www.logo-loops.com/online-store. My daughter normally does not like any kind of hair style. She never wants me to put anything in her hair; she prefers to leave it down and loose. So I was thrilled that she likes these new headbands, because at least I can get her hair pulled back. 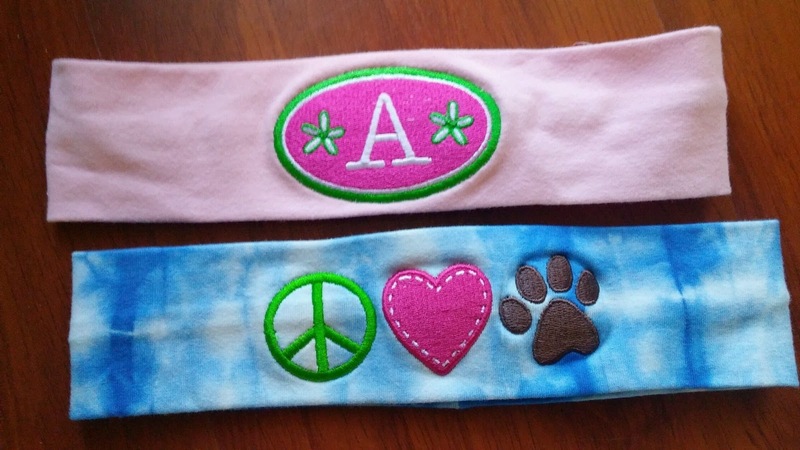 First, we received a customized headband for each girl monogrammed with their initial. 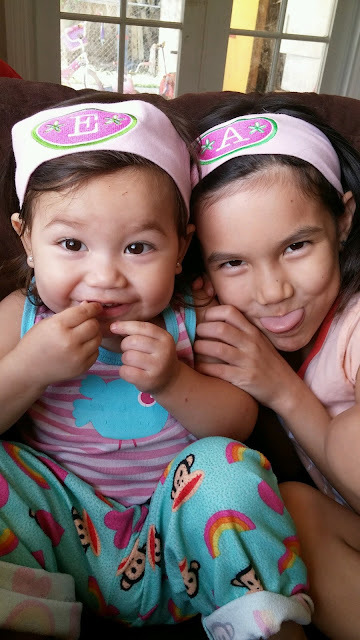 The girls were so excited to try on their new matching headbands. They couldn't wait to wear them on our outing to the science center. We also received two other headbands, one with a design of hearts, and another with a peace, love, and paw print logo. My daughter's elementary school mascot is the Panthers, and so their school logo is peace, love, and a paw print. She already has a school spirit t-shirt with this logo that she wears on Fridays (her school has uniforms) so the new headband is the perfect accessory. The headbands seem like very good quality. They don't look like they're going to stretch out or fade any time soon. 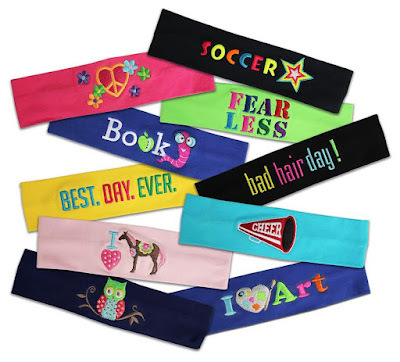 My daughter finds them very comfortable, which is important because she's normally somewhat particular about other headbands being uncomfortable for her to wear. Logo Loops would be the perfect thing for a team. I'm thinking about ordering them as party favors for my daughter's next birthday party. I am very pleased with Logo Loops, and it's great that they have so many different design themes available, so I can order more as we need them for different holidays and activities. One winner will Receive Choice of Two Logo Loops! I love the Don't Worry Be Happy and the City Girl bands! I would get the Daisy initial and the fa la la bands! I like the JESUS LOVES ME and the KICK IT - KARATE bands! I like the PEACE LOVE DANCE and the Love Ohio bands. My favorite 2 headbands are the light blue tie dye and the pink Lodie loops. I like the CRAB SEAHORSE SHELL, and the Initial designs. I like the chevron circle initial and the houndstooth initial headband. I adore the Panda and I know my daughter would love the Peace Heart. I like the Pretty Pony and Crown ones for my daughter! I like Jack-O-Lantern & Fireworks. So chic. Thanks! Wow, What a Excellent post. I really found this to much informatics. It is what i was searching for.I would like to suggest you that please keep sharing such type of info.